Michael Raffl skates with the puck against the Cancucks in February. And at the expense of his nerves. Well, the deadline came and went, leaving Raffl with mixed emotions – like his teammates, he hated to see Wayne Simmonds go – but with a great sense of relief. "I slept like a baby that night," said Raffl, who turned 30 in December. "I got a lot of hours in because I was exhausted. And I couldn’t believe how tired I was even after I woke up. Because of the stress. So much thinking about it. "I’m very happy to be here." Raffl has just 15 points this season (five goals, 10 assists), but is a plus-5 playing most of this season as a bottom-six forward and with limited ice time. What’s changed for him slightly over the last handful of games – and especially with two top-six regulars out Sunday -- is an opportunity for a shift here, a shift there, to play with some of the guys at the top, particularly Claude Giroux. So if you think a line’s not going, you put him in there. 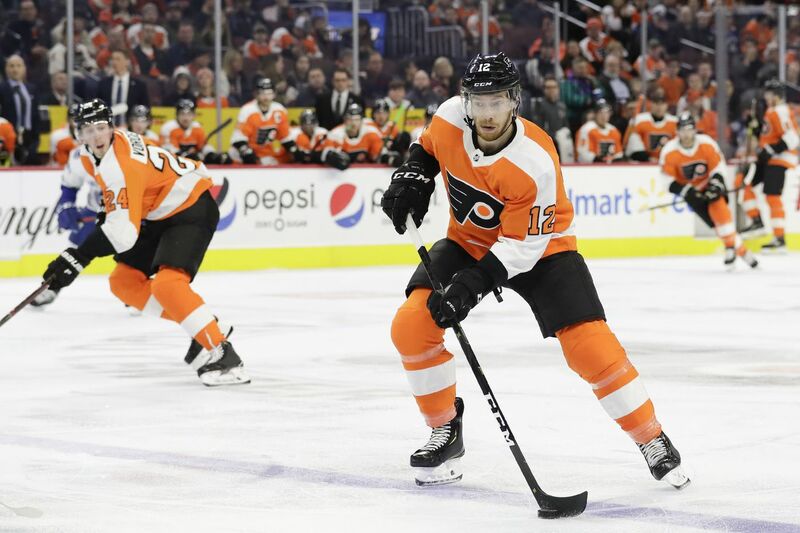 On Sunday, with Jake Voracek sidelined with a lower-body injury, Raffl jumped from his fourth-line status to a second line with Oskar Lindblom and Sean Couturier. A head injury to Nolan Patrick jumbled those combinations even further, evidenced when Raffl was out in the slot for Travis Konecny’s first-period goal that gave the Flyers an early 1-0 lead. Raffl played 22 shifts. He assisted on Scott Laughton’s second-period goal that pushed the Flyers’ lead to 3-0, prying a puck from two Islanders defensemen behind the net and feeding Laughton in front. The Flyers have 16 regular-season games left. A playoff spot would extend that, but Raffl knows the uncertainty will return whenever the season ends.